Companion planting means growing certain plants together with the hope and intent that one will benefit another or that both will benefit each other. Companion planting is a bit of art and science; not all of the claims for companion planting have been scientifically proven, but anecdotal evidence and collected garden wisdom seem to support keeping some plants close and others at arm’s length. One of the most helpful influences one plant may have for another is the ability to repel pests and or attract beneficial insects. Other plants–mostly legumes–aid other plants by helping to enrich the soil. If you decide to give companion planting a try, keep in mind that companion plants do not need to be bosom buddies. Vegetable garden companions will still have a positive impact even if they are many feet away or several planting beds apart. I love the Kitchen Garden Grower’s Guide and use it regularly. However, I struggle with understanding the spacing to leave between two plants that are not good companions (i.e., incompatible plants). I only have two 4×8 vegetable boxes, oriented north to south, so not a lot of room and I rotate crops. I use a square foot gardening method, sort of. Here are my questions: For example, how far away from my beans or peas should I plant the onions or chives? If I put a square of kale or lettuce between the legumes and the alliums, will that work? I still have two tomatoes growing on the trellis on the north end of each of box, but it’s time to plant my winter greens. How far away from the tomatoes do I need to plant the kale? If I plant a square of something like lettuce between the tomatoes and kale, is that sufficient? Thanks! There are no scientific or university studies on companion planting. Companion planting suggestions are based on anecdotal evidence shared by gardeners through the years. It has been observed that some crops simply don’t do well when planted close together. Given the small space you have to grow, plant non-companions as far apart as possible and then record the results–that is your observations of how each plant does. Experience will be the best teacher. 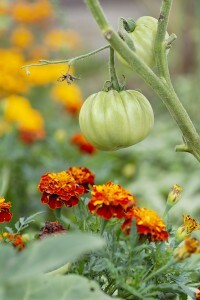 Growing in small beds can be a challenge when it comes to companion planting or crop rotation. Thank you for that information. My grandmother always told me that gardening was as much an art as a science. 😊 She was a wise, and prolific gardener.